The School’s Curriculum Policy sets out the main features of the School’s curriculum and is supported by the School’s various plans and schemes of work. A copy of the Curriculum Policy 2017 is available. The policy is also available in hard copy upon request to the School Office and may be inspected at any point in the School day in the School Office. 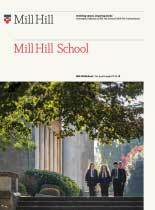 Mill Hill School aims to provide excellence in education and to support all of its pupils in the passage from childhood towards adulthood. At the same time, it seeks to develop in every pupil self-discipline, responsibility, spiritual and moral values, leading to the highest possible standards of behaviour, consideration for others, pride in oneself and in one’s achievements. The academic curriculum provided by the School plays a key role in helping us to meet these aims, and we seek to offer a broad, flexible and forward-looking curriculum which encourages among pupils intellectual curiosity, sound learning and a spirit of enquiry in the pursuit of academic excellence. Provision for Pupils with Special Educational Needs (SEN) and Learning Difficulties and/or Disabilities (LDD) The School is committed to allowing equality of access and opportunity to all pupils, regardless of their background, ability and any particular individual difficulties or disabilities which they may experience. The Learning Support department plays a key role in this work, seeking to identify, through screening and ongoing monitoring, the particular needs of individual pupils and putting in place strategies (and, where necessary, additional assistance) designed to help them fulfil their potential. Pupils who have a Special Educational Need or Learning Difficulty and/or Disability may have their curriculum modified to take account of their particular needs, as appropriate. Such decisions are made by the Deputy Head (Academic) in consultation with the pupil and his/her parents/guardian and Housemaster/mistress and on the advice of the Head of Learning Support. Where a pupil has a statement of special educational needs, the requirements of the statement are closely followed in order to ensure that the School provides an effective and accessible educational experience. Pupils with significant learning difficulties and/or disabilities are provided with an individual education plan (IEP) and their needs and progress are regularly reviewed. Personal, Social, Health and Religious Education (PSHRE) The School runs a PSHRE programme which is designed to complement the academic curriculum and to help ensure that all pupils are able to achieve the goals of the Every Child Matters agenda. The modular programme runs in the Fourth Form and Remove and continues in the Lower and Upper Sixth Form. Further details of the PSHRE courses are set out in the detailed guides to the Curriculum and in the PSHRE schemes of work. Through the tutor system, presentations and information evenings, pupils are helped to make the best possible choices of GCSE, AS and A level courses. They are similarly helped to make the best and most appropriate higher education choices and in the Sixth Form they are assisted in this by visits to universities and colleges as well as by presentations, workshops and information evenings. Careers Education is also included within the School PSHRE programme and specific Careers Education units are provided in the Fourth Form, Remove and Lower Sixth. The School has an active Careers Department which provides information and advice on possible future careers paths. It is based in the Piper Library, where a wide range of careers-related information and guidance is available. For pupils whose first language is not English, additional support is provided, as appropriate, by the EAL department. This provides class or individual tuition, as appropriate, in the four core areas of reading, writing, speaking and listening in order to allow non-native speakers of English fully to access the curriculum, to prepare them for appropriate EAL examinations, to exploit their academic abilities and to enjoy all of the social and cultural aspects of life at the School. In some individual cases, pupils who require EAL support follow a modified curriculum in order to accommodate this. For some pupils extra, individual, EAL tuition in addition to class lessons is needed. This is arranged through the EAL Department, in consultation with parents and guardians. In the Fourth Form EAL lessons are provided to those pupils who need it, usually in place of French/German/Spanish. If it is appropriate for an EAL pupil to take one of these three modern foreign languages, special arrangements are made for their EAL lessons. In the Remove and Fifth Form EAL lessons are provided to those pupils who need it, usually in place of French. Pupils are prepared for GCSE English as a Second Language and are also supported in developing the English language skills they need to use in their other subjects. In the Sixth Form EAL lessons prepare pupils for the IELTS examination and also provide language support for their work in their AS courses. Some EAL pupils take three, rather than four, taught AS courses in the Lower Sixth as they find that their work takes them more time than most native English speakers. However, they usually sit the AS examination in their own language (if available) when they sit their other AS examinations at the end of the Lower Sixth year, so that most still gain a minimum of 4 AS examination results. In the Upper Sixth most EAL pupils take three taught A2 courses (as other pupils) and at the end of the year also sit the A2 examination in their own language (if available), so that most gain a total of four A level examination results.